Click on the picture for a high resolution JPG image. 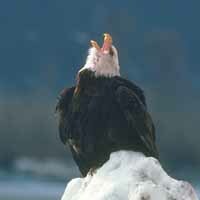 Spectacular full frontal view of American Bald Eagle in flight. 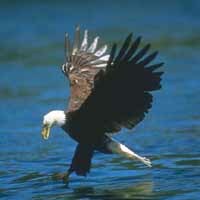 Eagle soaring over water with fish in his talons. 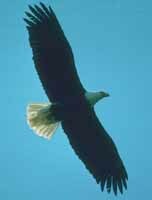 Eagle soaring above us with full wing spread. Eagle soaring at eye level. Eagle turning with sun on his back (good color and detail). 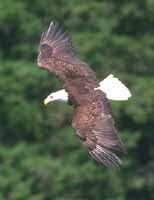 Eagle soaring with sun on his back. Eagle about to snag a fish out of the lake. 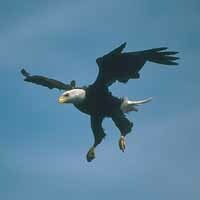 Eagle coming in for a landing. Eagle perched in a fir tree. Eagle perched on a branch (from behind). 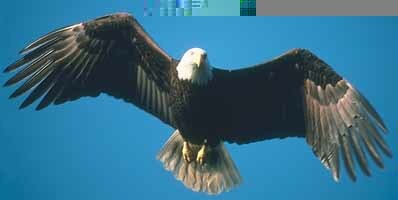 The above Pictures were edited from the Bald Eagle collection of COREL Professional Photos Collection. You are visitor since July 23, 1996 Thanks for stopping by!